Absorbant Glass Mat (AGM) technology for superior performance. Valve regulated, spill proof construction allows safe operation in any position. Approved for transport by air. D.O.T., I.A.T.A., F.A.A. and C.A.B. certified. U.L. recognized under file number MH 20567. 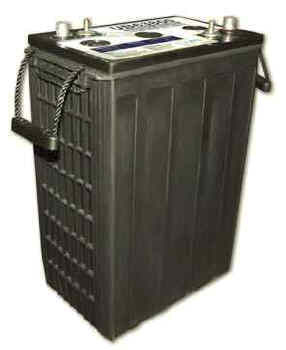 This UB63800 group L16 is an Absorbed Glass Mat (AGM) sealed maintenance free 6 volt 380 Ah deep cycle battery. With 810 minutes of discharge at 25 amps, this battery will become the workhorse behind your remote telemetry system. Use the UB63800 as a backup battery or as the primary solar battery. Approved for transport by air. D.O.T., I.A.T.A., F.A.A. and C.A.B. certified. U.L. recognized under file number MH 20567.